Melbourne Festival returns October 8-25 to celebrate 30 years of presenting the city’s best arts experiences. With a jam-packed line-up of dance, music, theatre, film, circus and visual art, this year’s program is one not to miss! On the schedule are a promising number of local and international dance companies. Perhaps the most anticipated is Batsheva Dance Company, returning to the festival with two works – the Australian exclusive performance of Last Work and also Decadance. Known as one of the most important contemporary dance companies in the world, Batsheva Dance Company is led by one of the most exciting, visionary and original choreographers at the very top of his game, Ohad Naharin, the creator of Gaga. 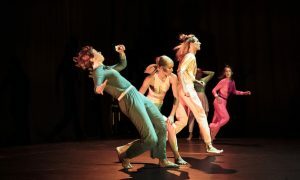 Based in Tel Aviv, Israel, the company first amazed Melbourne Festival audiences in 2000 when they made their debut with Anaphase. The dancers returned in 2008 with two programs, Three and Max. Both seasons proved to be landmark moments in the festival’s history. Batsheva Dance Company performs ‘Decadance’. Photo by Maxim Waratt. Pulsating with history and heart, politics and place in a collision of fiery individualism, the company tells evocative stories through its unique movement language. Decadence was first created in 1990 and now features many new additions. A kaleidoscope survey of Naharin’s repertoire, this work offers audiences a multifaceted selection of memorable moments from the company’s 50-year history. Naharin reconstructs his oeuvre by taking sections of existing works and reorganising them into a fresh new theatrical experience. With a soundtrack that veers from Vivaldi to Dean Martin, this dynamic showcase of dance features heartbreakingly intimate moments and exhilarating full company pieces. Last Work, on the other hand, is fresh from its world premiere in Tel Aviv this past June. It brings Australia’s Batsheva fans up-to-date with the celebrated company’s most recent exploration of motion and emotion. In it, Naharin and the Batsheva dancers explore the body’s motion as the most humane, stirring expression of performing arts and synthesises the infinite spectrum of emotions and sentiment into performance. Both Batsheva programs will be presented at Arts Centre Melbourne’s State Theatre, with Decadence set for Thursday, October 15, and Last Work for Saturday and Sunday, October 17 and 18. 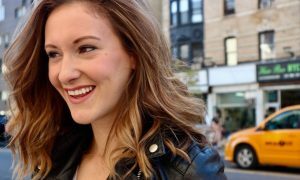 Australian dance company member Rachael Osborne, who will perform in these programs, will also present a free Gaga Workshop at Chunky Move Studios on Saturday, October 17. at 11 a.m. She has been with the company for almost 12 years and perfectly captures the unique movement vernacular of Gaga. Peeping Tom’s ’32 Rue Vandenbranden’. Photo by Herman Sorgeloos. The next dance show, Peeping Tom’s 32 Rue Vandenbranden, is also an Australian exclusive performance. This production by the admired Belgian physical theatre provocateurs comes to Australia after recently receiving the 2015 Olivier Award for Best New Dance Production. Viewers can expect a hyper-real collision of jaw-dropping physicality, cinematic set design and macabre slapstick. Two rickety trailer homes set the scene within a snow-covered landscape in 32 Rue Vandenbranden. Under a wide-open sky, six inhabitants of an isolated mountaintop community grapple with a blurred reality and their visceral responses to an inescapable loneliness. As internal forces determine which turn each individual takes, their motives are exposed and stripped of consciousness. Last seen in Melbourne Festival in 2009 with Le Salon, Peeping Tom has toured internationally with this uncompromising show. 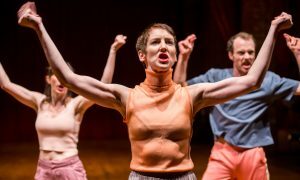 A genre-defying volley from the subconscious: poetic, mesmerising and utterly unique, audiences have been blown away by this unforgettable piece of dance theatre. 32 Rue Vandenbranden will be presented at Southbank Theatre on Thursday-Sunday, October 8-11. Plus, a dance workshop will be led by multi–talented dancer and Peeping Tom collaborator Jos Baker on Saturday, October 10, at 10 a.m. at Chunky Move Studios. ‘NYX’. Photo by Dian McLeod. 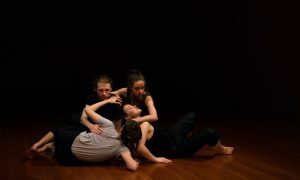 The same weekend at Arts House, Australia’s maverick choreographer Antony Hamilton will present the world premiere of NYX – a work joining dance, voice and percussion and seeking to push choreography to its limits. NYX promises an uncompromising vision of human ingenuity and cruelty, where the masquerade of progress shows itself to be bestial fury by just another name. In the spirit of Hamilton’s internationally acclaimed Black Project 1, this is dance that thrusts choreography to its aesthetic limits and beyond. Finally, on the same weekend as Batsheva, Melbourne Festival presents the Australian premiere of Right&Left by Gu Jiani, a prodigal multidisciplinary choreographer from China. This intricate shadow dance fuses a dance language of incredible precision with a visually arresting mix of projection and light. Right&Left offers an elegant and entrancing perspective on our oldest questions: why do we love, and how do we stop it from destroying who we are? Jiani, native of Sichuan, performed with the Beijing Modern Dance Company from 2008-2011. She has performed in Canada, Italy, Israel, Belgium and Africa, and at the Shanghai International Arts Festival. Her work will now be presented at The Coopers Malthouse. 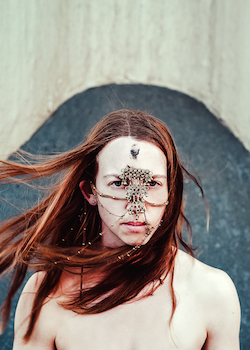 For more information on Melbourne Festival’s 2015 dance shows, visit www.festival.melbourne. See the shows listed by their dates below. Photo (top): Batsheva Dance Company in Last Work. Photo by Gadi Dagon.